This final cover is special in so many ways that I don’t quite know where to begin. I once told John Byrne that he can draw a character standing stock still and somehow still make it look amazing. I’ve always felt that, when John drew a character, it was pretty much the best that character was going to look. 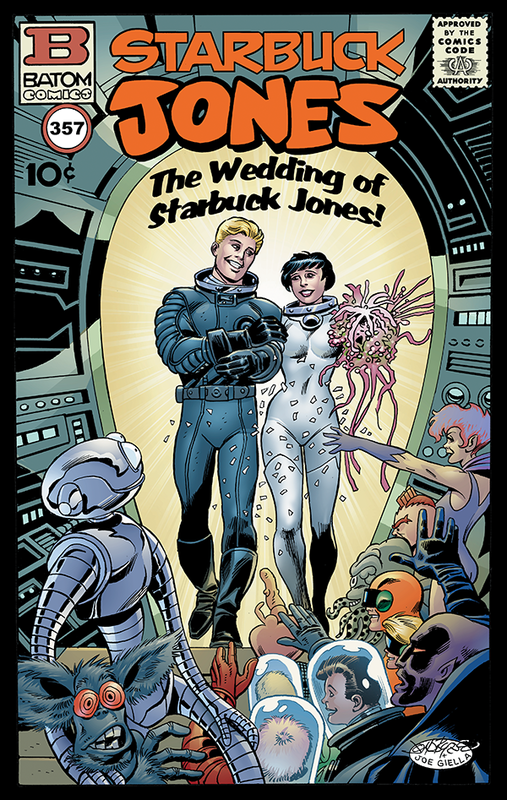 So you can imagine my delight when John signed on to draw the wedding of Starbuck Jones cover which featured as guests Isaac, Moon Mile Meek, The Lunar Cadets, The Black Ghost, The Amazing Mr. Sponge and Absorbing Junior, Blue Astra and, of course, Starbuck and Jupiter Moon. The next stop for these amazing covers is the Heritage Auction on November 17th in Beverly Hills and online. Perhaps the final stop for one of them will be in your collection. The winner of each cover will also receive a beautiful color print of their cover and how it appeared in its Funky Winkerbean Sunday page. Along with getting some terrific art, you’ll also be contributing to the fight against cancer. My thanks once again to Heritage Auctions for donating the all of the proceeds from this special auction sans any fees to the Lisa’s Legacy Fund for Cancer research. One final note, you can also follow the auction of the covers that same week in Funky as Jessica and Lisa’s son Darin appear at the auction. I’ll be there as well and will have a full report as soon as I’m off the road and back home in my Cartoonist’s Fortress of Solitude.